Unlike most popular music that focuses on negativity, anti-American sentiment or hedonistic desires, patriotic rockers Madison Rising go the extra mile to craft songs with positive messages; songs that are about something – about soldiers, sacrifice, freedom, liberty, gratitude, and living the American dream. This is exactly what this country needs right now, and millions of Americans have been touched by the effort, passion and sheer love of country these young men put into everything they do. 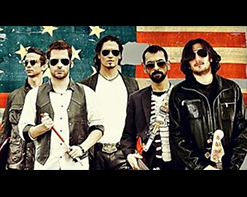 Madison Rising released its best-selling rendition of the Star Spangled Banner in the summer of 2012 and both the song and video have become huge hits, catapulting the band into the national spotlight and creating one of the most loyal fanbases in rock music history. “Awesome,” “deeply moving,” “chilling,” and “the best ever,” are just some of the superlatives used to describe Madison Rising’s rendition of the song that celebrates what being an American is all about. The band has an especially strong following in all branches of the military, and among veterans, bikers, 2nd Amendment groups and other patriotic crowds along with a great crossover appeal in the country market. The band has performed at a numerous military and USO events, NFL half-time shows, at NASCAR, Sturgis, and other major venues, as well as having opened for rock legends including Lynyrd Skynyrd, Steppenwolf, Kansas, Weezer, Toby Keith and others, and has just released their new album, American Hero, dedicated to the men and women of our armed forces, along with other first responders. Lead singer Dave Bray is a Navy veteran and former Corpsman for 2nd battalion 2nd Marines. For more information on Madison Rising’s new videos, please contact Andy Gesner and the HIP Video Promo staff at (732)-613-1779 or email us at info@HIPVideoPromo.com . You can also visit www.MadisonRising.com for more info.